Who is Brown really trying to convince in this account of his life in politics? Perhaps ultimately, himself. 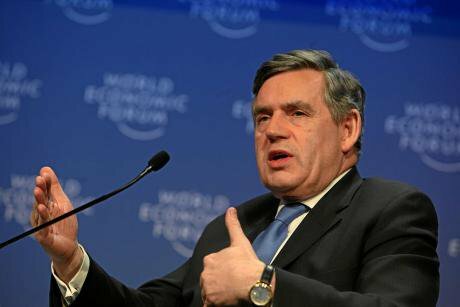 Image: Gordon Brown at Davos, 2009. WikiCommons. Gordon Brown, like him or loath him, was a titan of a figure in British politics for close on two decades. Gordon Brown’s life story could be gripping and compelling. It contains all the hallmarks of good drama. Here is a man gifted with rare talents and drive, who knew he wanted to serve. At an early age comes tragedy when he is deprived of eyesight in one eye. This does not stop the young Brown but only makes him more determined and resolute. His inexorable rise to the top is captivating. A bright star in Scottish and British Labour from an early age, Brown makes a mark from the moment he is elected an MP in 1983, forms a partnership with Tony Blair, is central in the creation and success of New Labour. And then at the height of his power and persuasion, he allows it all to go horribly wrong. Despite everything, he eventually attains what he has long yearned for - to be Prime Minister of the United Kingdom, and in so doing saves the world from calamity in the banking crash. And yet all the while a hunger, yearning and emptiness gnaw away at him. Brown is a fascinating tour guide of all things related to Brown – although not an entirely convincing and reliable one. He is, on first reading, a clear writer who appears to know how to present the key facts and analysis of complex, seemingly intractable problems. He is a voracious reader and writer of numerous books over more than forty years. In the Brown account of his rise to the top however, there is no crisis or opportunity for which the solution isn’t more Brown. Sometimes this just entails the act of writing a book: whether it be on preparing his public image to be Prime Minister, on the death of John Smith, or in the heat of the indyref or Brexit campaign. There is a political intelligence and insight in this work. If you came to it not knowing anything about the events in question or Gordon Brown, you would note how persuasive he can be, how seemingly reasonable and calm. Here is a voice who can neatly get to the core of an issue and make the case for pragmatic, progressive, humane solutions to some central concerns of our age. Yet there is a hole at the heart of this book. In every major crisis Brown is convinced of the merits of his own analysis – the only issue being whether he can convince others of the merits of his case. And given Brown believes he can analyse, summarise and get to the core of any issue, all that matters for him to successfully clinch each deal is presentation, access and pressures of time. This is true throughout the book from his ten-year tenure as Chancellor, trying to control and bend Blair to his will, and most spectacularly, in the global banking crash (where he undoubtedly was a force for good). Yet the sum total of this is deflating. It reduces politics in Brown’s world to one-way communication and monologue: absent are those important qualities to life, let alone politics, of listening, hearing and genuine exchange. Running through the book Brown shows his continued lack of self-reflection and self-awareness that limited him as a politician and ultimately stymied his ability to be a successful Prime Minister. As serious is the missing self-reflection on his own political odyssey and record. Towards the end of the book, Brown continually cites the problems of globalisation, technological change and economic and social dislocation. He worries rightly about the rise of populists, xenophobes and the new reactionaries, and concedes that much is wrong with the present state of the world. But nowhere in any of this is there any detailed self-analysis of Brown’s role in bringing about the state of politics he now openly thinks such a problem. Globalisation as an elemental, economic and social determinist entity carrying all before it and to which all resistance was futile, was a central canard of New Labour and the Blair-Brown years. But you won’t read anything about that here. At crucial moments, Brown’s lack of self-awareness gives way to something deeper - a strand of self-deception. Thus, the Blair-Brown ‘Granita’ pact of 1994 – whereby Brown agreed not to stand for the Labour leadership after the death of John Smith and let Blair have a free run – did not set in stone the agreement Brown thought it did. Brown took from the meeting that in return for Blair standing as ‘the moderniser’s candidate’ with Brown’s support, Blair would, in turn, stand down to let Brown take up the leadership in a second term. There is at best a profound naivety in Brown taking such an undertaking on face value. In many respects the Granita deal decided nothing. By then Blair was already the future of Labour, and Brown must have known that, and worried that he had missed his chance by not standing for the leadership against John Smith in 1992. There is a similar selectivity in how Brown presents the case of the attempted coup against Tony Blair in 2006. While not exactly successful at the time, Blair was forced to make clear his plans, and pre-announce his intention to resign the following year. According to Brown, these moves were led by his loyal lieutenants Ed Balls and Tom Watson – and undertaken without his knowledge and permission. That’s just stretching things a little too far. And when he gets the opportunity to become Prime Minister he makes no mention of how he goes out of his way to make sure it is a court succession, a transfer of power without any proper leadership contest. Thus, two potential candidates, John McDonnell and Michael Meacher, are squeezed out of getting the required nominations. Such is Brown’s fear and dislike of a contest. All of this comes back to haunt him as he hits problems - a Prime Minister elected by coronation has less legitimacy. Of course the biggest deception in the book is the Iraq war. Brown dares to present himself as a victim, like the rest of us, of Blair’s unholy alliance with George W. Bush and the neo-cons. Brown claims he was taken in by the Blair-Alastair Campbell selective presentation of intelligence. That if he knew then what he knows now, he would take a different view. Robin Cook, reading the same documents before the Iraq War, knew that he and the British Parliament and public were being played. Brown writes: ‘When I consider the rush to war in March 2003 – especially in light of what we now know about the absence of weapons of mass destruction – I ask myself over and over whether I could have made more of a difference before that fateful decision was taken.’ Who is Brown really trying to convince with such a self-evidently implausible, preposterous account? Perhaps the answer is ultimately himself. Brown – like many others in the party - believed that Labour had been tainted by the Tory brand in the indyref, and that this made necessary a separate Labour campaign in the EU referendum. But this played into the view of the Eurosceptic Corbyn Labour leadership. There was rich irony in all this. Labour had come full circle, returning to the Labour separatism and chauvinism which had been evident in Helen Liddell’s memo (when Scottish Labour General Secretary) for the 1979 devolution referendum, forbidding Labour cross-party co-operation with the SNP. That hurt Labour and devolution in 1979, and the Brexit Labour stand-off had even more fatal and damaging consequences, contributing to Leave’s triumph. Brown’s character is mostly missing from much of his account. There are no tales of his legendary tempers and rages, which made him almost impossible to work for and many of his colleagues fearful of him (and for him). There are no stories of his excessive, obsessional, almost Mafioso tribalism, whereby his most trusted followers had to pledge complete and undying fidelity to the great one. Yet, if they disappointed or contradicted him sometimes on the smallest detail, they could be out, sent to the Brown equivalent of outer Siberia. Brown, in large parts of this book, is the ghost in the machine: someone ever-present and omnipresent, but not quite there, particularly in regard to understanding himself as a person, player and influence in any given situation. Brown himself only understands his limitations in the most obvious and restricted way: in communication and in the art of social media. He just does not comprehend his wider failure. The Brown story as told by ‘My Life, Our Times’ is a fascinating one - of tragedy, hubris, denial and self-deception. There is the account of what happened to British politics, British Labour and the social democratic tradition over two decades. How it tried to achieve a greater common good by pragmatism and realism under New Labour, but came adrift of its moorings: scared to champion progressive values, sucking up to the super-rich and City, promoting an unbalanced, unsustainable vision of the economy, and getting in to bed with a bunch of fanatical right-wing Washington warmongers. That tale is Tony Blair’s and Gordon Brown’s, and we live with the consequences of it to this day. Just don’t expect to find a fulsome understanding of it here (nor in Blair’s even more selective and self-deceiving memoir). And that is tragedy - and missed opportunity on top of a tragedy. But we, more than Brown (and Blair), have to live with and overcome the damage it has created on a human, democratic and ethical level both here and globally. This is a book selling a version of the past which ultimately has little constructive to say about the present and future.